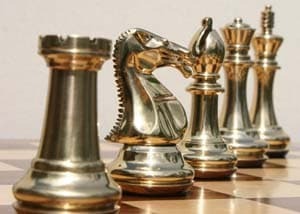 Indian men's team put up a splendid show holding defending champions Armenia to a draw on all boards in the eighth round of the ongoing 41st Chess Olympiad to remain seventh in the leader board. India men are currently placed seventh with 12 points in their kitty. The Indian open team on Sunday drew 2-2 their match against much stronger opponent Armenia at the World Chess Olympiad underway in Norway. The Indian open team had the crucial advantage of playing with white pieces on the first and third boards against the Armenians. On the top board, Indian GM Parimarjan Negi (elo points 2,645) was up against world number two GM Levon Aronian (elo points 2,805) who is said to be deadly with white pieces. Negi opted for the Ruy Lopez opening, and on the 14th move, Aronian went in for queen exchange. "That only showed Aronian's good preparation for the game," world number 26 GM P. Harikrishna told IANS. On his part, Negi went for exchanging the minor pieces, and on the 33rd move, both the players signed peace treaty. The second board duel between GM Sethuraman S.P. (2,590 points) and GM Gabriel Sargissian (2,686 points) also ended in a draw. The third board saw GM K. Sasikiran splitting the points against GM Sergei Movsesian following perpetual checks to black king by the Indian queen. A positive result for India was mainly expected from the experienced Sasikiran to take the team forward. On the last board, the fight for opponent's king was between GM B. Adhiban and GM Vladimir Akopian who agreed for a draw on the 35th move.